Using the latest version of IntelliJ on one computer and the latest EAP on another, I don't seem to be able to browse Subversion repositories using VCS > Browse VCS Repository > Browse Subversion Repository. My repository is not listed - no repositories are. However, I am able to commit and update my project via SVN just fine. What do I need to do to browse the currently configured repository? All you should need to do is add the desired repository using the add icon on the left. Does that resolve it for you? Is there a way to view the repository url that is currently being used for commits and updates? Ideally, I'd like to have a way to be sure that what I view in the browser is the same as what I am committing to, not have one location (commit repository) specified in one place (which I can't for the life of me find) and the other (browse repository, same location) in another. If my dev SVN got changed to a new server, I don't particularly want to have to be sure to remember if I changed the browser repository also. Especially if they have similar structures. But if for some bizarre reason it has to be entered seperately for the browser (which really doesn't sound right to me...) I want to copy and paste the URL I am committing to into the add repository location dialog. The repository browser is (or at least originally was) geared towards browsing a repository for the sole purpose of checking out code. The "in use" repository is not configured in IntelliJ IDEA at all. 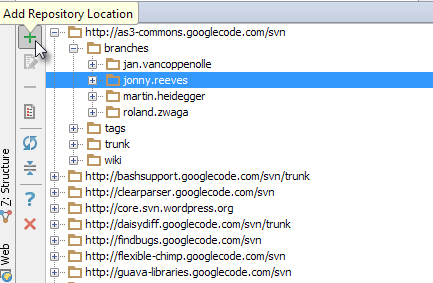 The SVN client reads the repo information from the database in the .svn directory. To get a value you can copy and paste, run the svn info command for your working copy.